It’s clear that a Rocky Mountaineer train can’t set off from a station without someone standing on the platform waving goodbye to the passengers. Kamloops’s staffing levels however are a bit lower than Vancouvers, leaving just four people to stand and say goodbye to us as we leave the station for our second and final day of train travel as we head to Jasper. The train has also shrunk a bit overnight; several of the coaches and at least one engine have been left behind somewhere, presumably on a nearby railyard. From Kamloops the Rocky Mountaineer can go in one of two directions. Some trains head over the Canadian Pacific lines to Banff, but ours is going the other way to Jasper on the Canadian National line. It will take us into the Canadian Rockies proper. But first there’s breakfast to think of as the train crew work once more to put the pounds on their passengers. We quickly leave the dry land behind and enter forest territory. Indeed there are so many trees that the views are frequently blocked by them which at least means I’m not having to leap up every five minutes to take photographs. If it’s not trees getting in the way of the snapping its telegraph poles. Once used to send messages between villages on the railway line the poles are now unused and decaying; many looking like they’re close to falling down and being swept away in the river. Removing them would cost $500 each, we’re told, and as such the railway companies just let them rot. 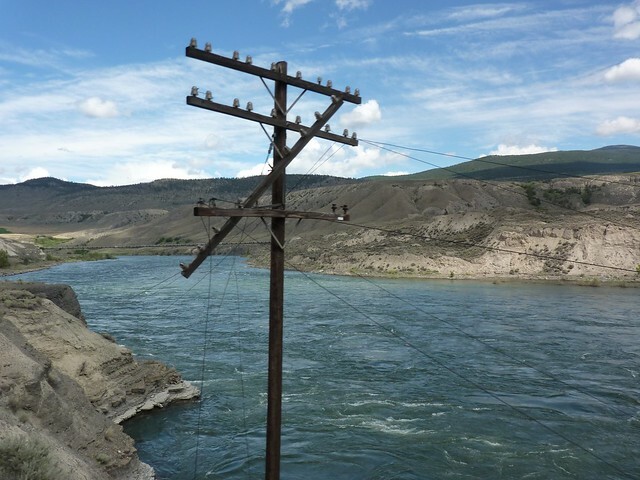 But with rising copper prices it one day might be worth, at very least, stripping them of their wire. But not yet. Many of the glass insulators on them are worth a bit more and there’s a thriving antiques trade in them, especially the ones where the glass has been oxidised, changing colour to rich blues, greens and blues. If it’s not trees and it’s not the poles then it’s the rain. 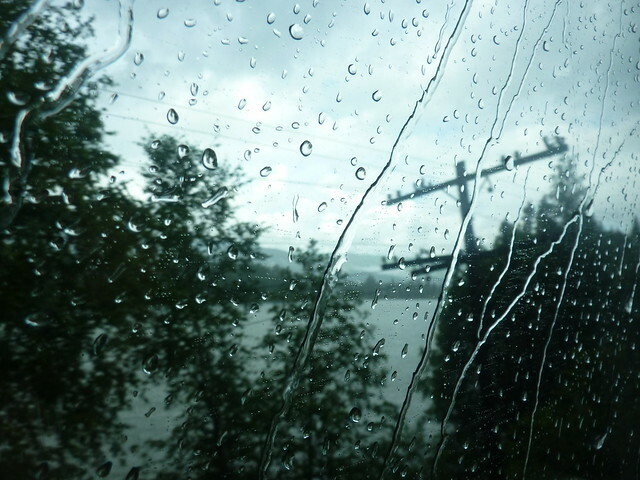 So much for it being dry out here as the train goes through a shower; the rain snaking its way down the glass window. Two different train companies laid their tracks side by side for much of the route in this area. They both became part of the Canadian National and the once intense competition means that there’s less waiting for freight trains than the day before, but still we sometimes have to sit and wait, and wait, and wait. The scenery is different to the previous day too with smaller communities sat alongside the track, and the scars of a forest fire from eight years earlier still visible. All started by one man popping out of a restaurant to have a cigarette. No small wonder that the Canadian’s use the phrase “fragile environment” a lot. 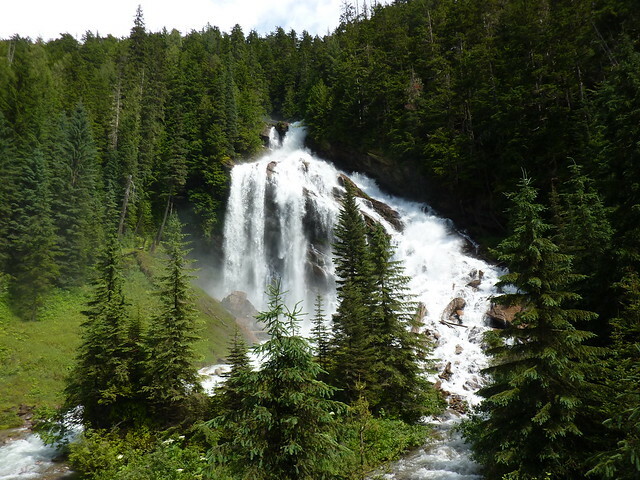 At Pyramid Falls a waterfall cascades down the rocks in a most attractive manner and soon its lunch. Or mid morning snack. Or post mid morning snack drink. Or something. It just seemed like if I sat down, food would probably arrive. A bowl of fruit even sat at the back of the carriage just in case we got hungry in the 45 minutes between food services. We’re gaining height above sea level all the time and the mountains are increasingly topped with snow. The train heads past the Premier Range, a series of 11 mountains named after early Canadian prime ministers. Then the train begins to slow down. We’re approaching the big one. 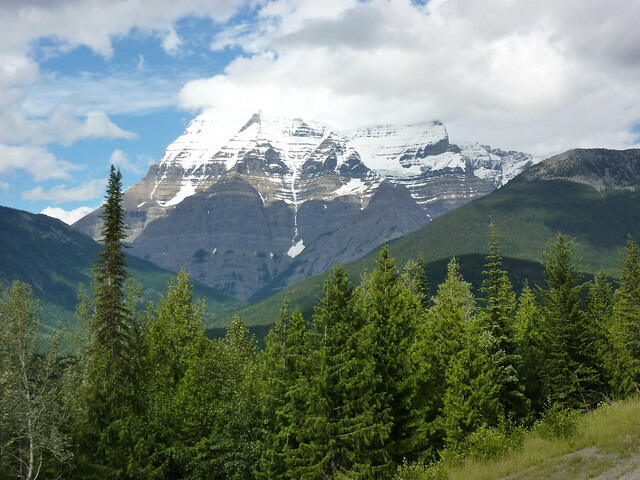 Mount Robson. The most prominent peak in the Rockies. 3,954 m high, it’s rarely seen without cloud on the top. Only 10% of all attempts to reach the summit, actually succeed. Best viewed from below methinks and I snap away in the vestibule along with the other camera fanatics; each of us moving out of the way regularly to allow others to get a shot. Then we’re in a tunnel and it’s gone. Looking at the map it seems we’re getting close to our destination and the train passes into the state of Alberta and the Jasper National Park. It’s time to change our watches. Alberta’s on Mountain Standard Time and that means it’s an hour later than it was a few minutes earlier. Our journey is almost over. Just enough time to settle any bills for those who have been persuaded to buy from the extensive souvenir catalogue and prepare to get off the train, to be whisked to our hotel by yet another coach. What a journey. Can there be a finer way to see amazing views than being sat on a train with nothing to do but take it all in, whilst being fed food and supplied with drink? 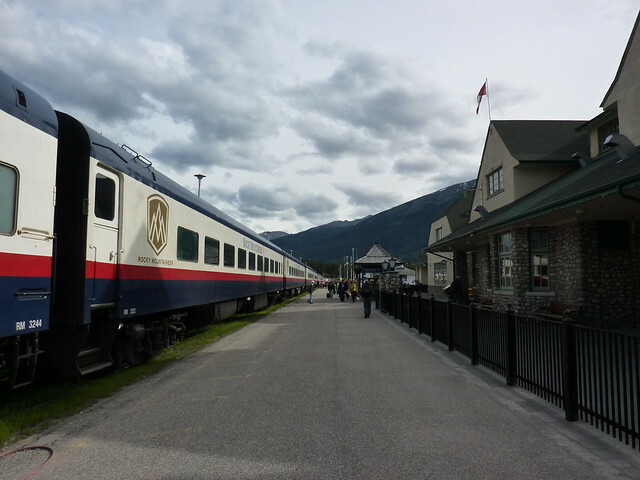 But whilst our journey was over, the next day the Rocky Mountaineer would be setting off once again. All aboard? Certainly. Hoot hoot.